Fast&Up India recently conducted an interactive session with Boston Marathoners where experienced marathoners shared their valuable thoughts. The Boston Marathon is the worlds oldest and the most prestigious annual marathon that kicked off in 1897 and this year, 15th April marks the 122nd marathon. 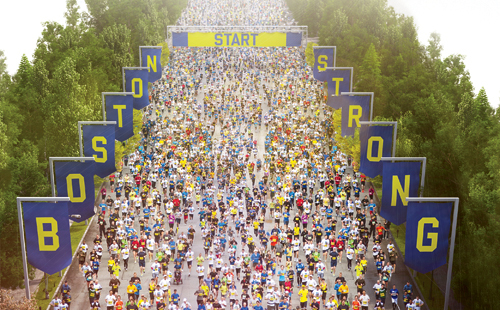 Every race around the world takes it's inspiration from the Boston Marathon. What's beautiful about this marathon is the spirit in which the whole city unites, involving themselves spreading a good atmosphere encouraging everyone to take part in it. Our experts share their wonderful experiences and they mention about the vibrant culture, spirit they enjoyed during the marathon. Every participant who takes part in the Boston Marathon is fit, with a tough bodies, every runner is strong headed with a determination towards fitness and possess a love for running. Experts tell us that one needs to be careful with the clothing as it could be super cold, gloomy in Boston during April. Keeping an open mind helps as people from all over the world, belonging to different cultures, countries come together in this marathon and make it a legendary one. A great amount of preparation is required for running the Boston Marathon and it is mostly recommended for athletes with a prior experience in running, as it is known to be a challenging marathon. We hope this helped all those who preparing for the Boston Marathon. For that extra fuel, energy and hydration to help your marathon preparations, check out Fast&Up range of products here. You can also watch the whole full video of the Boston Tea Party here.